Looking to the natural world for solutions to complex human problems is nothing new. Scientists and engineers have been doing it for thousands of years. In the 16th century, Leonardo da Vinci drew inspiration from birds and bats when attempting to build machines that could fly. And Swiss engineer George de Mestral invented Velcro in 1948 after observing how burrs clung to his clothes and his dog’s coat. Today, there is an entire field of scientific research dedicated to finding and adapting designs from nature. Known as biomimetics , it has spawned an array of new and innovative technologies that are solving all kinds of man-made conundrums. From robot bees to self-healing concrete and glass inspired by a spider’s web, here are just a few recent examples of science imitating nature. These miniature flying robots, about half the size of a paper clip, can lift off, hover and perch to save energy, just like real bees. Inspired by the biology of bees, and their ability to communicate with each other and sense their surroundings, scientists at the Harvard Microrobotics Laboratory in collaboration with Northeastern University created RoboBees . Artificial pollination was one of the original ideas behind the invention, but Robobees could have other uses . For example, assisting with search and rescue operations by swarming over large areas, entering small spaces and returning to their human handlers quickly with information. A type of glass coating, based on a spider’s web, is being used to stop birds crashing into windows. ORNILUX glass, created by German company Arnold Glas, has web-like lines that reflect UV light, and are invisible to humans but can be seen by birds. The idea came from the orb weaver spider, which spins webs with ultraviolet reflective strands of silk to prevent birds flying into them. It’s one of the most widely used materials in the world, but over time concrete invariably deteriorates and cracks. Thinking about how bones heal naturally through mineralization, Hendrik Jonkers , a microbiologist at Delft University, set about searching for a similar regeneration technique that would increase the lifespan of concrete. He found that adding limestone-producing bacteria to the mix could patch up cracks that formed in the concrete. The bacteria remain dormant until they come into contact with water entering through cracks. This activates the healing process, and the bacteria form limestone to fill the gaps. The result is a material that could add years to the life of buildings, bridges and roads. Inspired by a tropical carnivorous plant, scientists are now able to make surfaces so slippery that they become self-cleaning. Insects landing on the Nepenthes pitcher plant slide down its super-slippery surface and are devoured. After observing how the plant’s leaves repel liquids, researchers came up with a synthetic material that allows water, oil, blood and even stickier substances to slide off without leaving residue. The material, known as slippery liquid-infused porous surfaces (SLIPS), could be useful in many industries, for example for making self-cleaning windows and roofs, oil and water pipes and blood transfusion devices. 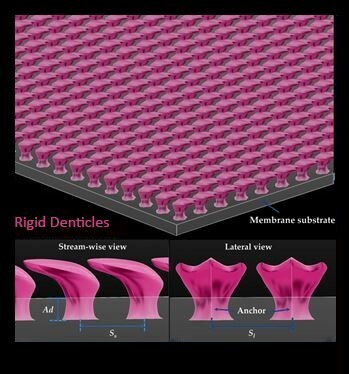 Scientists have been developing materials that mimic the hydrodynamic texture of sharkskin, which is made up of tiny tooth-like structures called denticles. As sharks move, their dermal denticles help the water to flow by faster. They also discourage parasites such as algae or barnacles from attaching to the skin. Sportswear manufacturers have developed synthetic sharkskin suits that enable swimmers to cut through the water faster, and with less effort. One study showed a 3D-printed flexible biomimetic sharkskin could increase swimming speeds by more than 6%, and reduce the energy it takes to move through water by approximately the same amount. When applied to the bottom of boats, synthetic shark skin could help to reduce fuel consumption and keep hulls cleaner. Have you read? These RoboBees could pollinate crops and save disaster victims Self-healing concrete and sweaty roofs: is this the future of buildings? Could the buildings of the future be made with bones and eggshells?